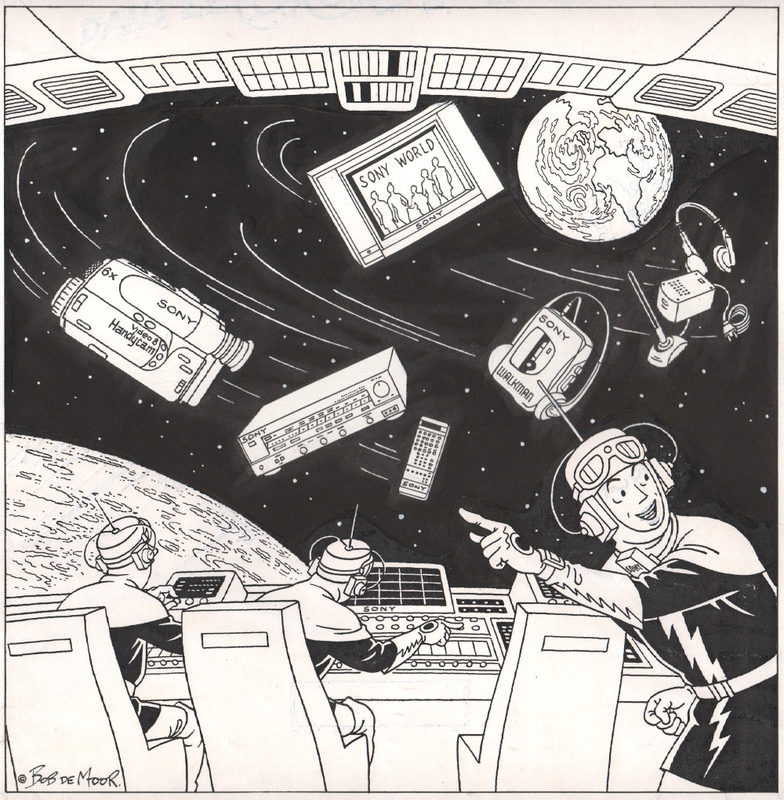 In September 2015 this site published the article “The cover for ‘War In The Cosmos’ which never got used for a French reprint” showing a drawing which appeared to be a never published before front cover for a new french version of “Oorlog In Het Heelal”, the story Bob De Moor created for the weekly magazine Ons Volk in 1949. Whilst being at Olivier Marin‘s place to scan some drawings, I also found a drawing which was a reworked version of the cover for a Sony advert. Since I never saw a version of this advert ever being used, it’s rather unclear if it was ever published in it’s final coloured version. Note that half of the drawing was a photocopy on which Bob De Moor altered a few things. Nevertheless, there are a few significant differences between the 2 versions. Let’s have a look! The first clear difference are the rockets/spaceships which have been replaced by Sony video/audio gear, some of which are now extinct. We recognise a video camera (the Video 8 Handycam), a Sony Hi-Fi Equaliser, Sony pocket calculator, a Sony World TV (no, not a flatscreen! ), a Sony Walkman, a Sony headset and what looks like an antenna which can be charged (if anyone has a clue what it is, let us know). Next you can see that Bob De Moor has adapted the expression on the face the character on the right. He is no longer looking angry but has a very happy expression. Bob De Moor signed the refurbished drawing, which he didn’t with the first original version. The part where the editor’s name was to be added has disappeared and the drawing ‘behind’ it has been completed. De Moor erased the title, but you can still see a trace of the original title. Let’s see if we can find the final version, I contacted Sony a while back but they didn’t get back to me regarding this. So if someone knows more about this drawing, let me know! 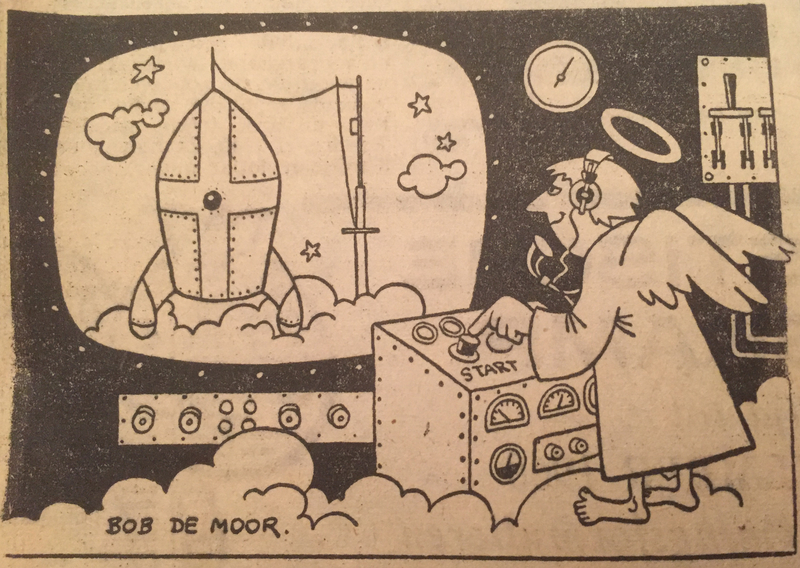 In December 2016 this site published an article titled “Sinterklaas with Bob De Moor in 1960” showing a cartoon which was published in the daily Het Nieuws van den Dag of 2 November 1960 (and which Yves Kerremans sent to us). 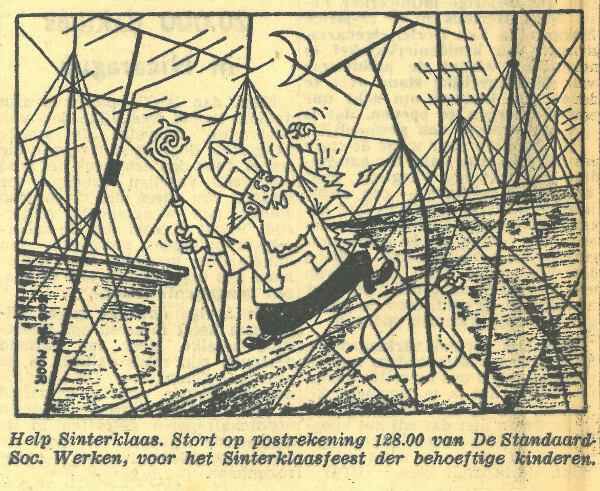 The drawing in that article depicts Sinterklaas on a roof full of antenna and was made for the ‘Help Sinterklaas’ action run by De Standaard Soc. for the charity “Werken voor het Sinterklaasfeest der behoeftige kinderen” which would for years help children in need, focusing a lot on helping out disabled children from 1967 onwards. 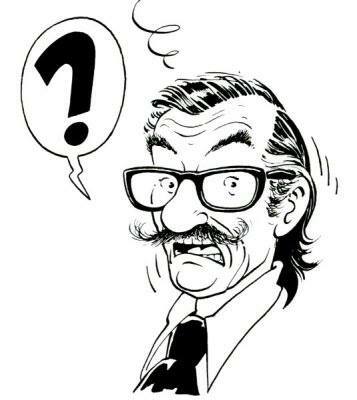 Many comic artists would contribute in the years to follow including Marc Sleen, Willy Vandersteen, Paul Geerts, Karel Biddeloo and so on. But I always wondered whether there were some other drawings by De Moor for that charity due to the date the cartoon was published (there was still time before the actual 6th of December, the day when Saint Nicholas actually visits the children). A few weeks ago Peter Van Hooydonck informed that he had found some more of these drawings, namely in issues of the daily Het Nieuws van den Dag. The ones he found were dated November 23 and November 26/27 1960. 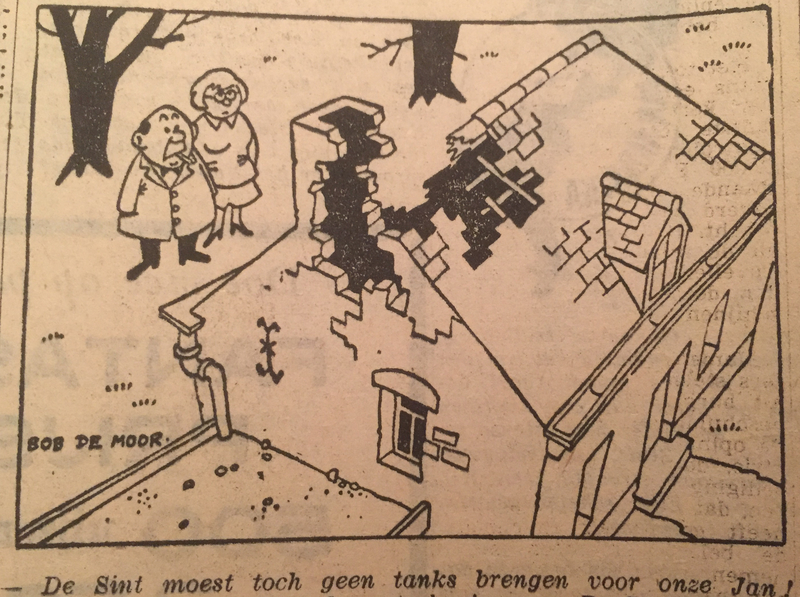 The one from November 23 1960 shows a father and mother looking at a destroyed (exploded) chimney and roof saying: “De Sint moest toch geen tanks brengen voor onze Jan!” (Dutch for: “The Saint was not supposed to bring tanks for Jan!”). The second drawing, from the weekend newspaper of November 26/27 1960, shows an angel ready to push the button to launch a rocket (filled with presents) shaped in the form of Saint Nicholas’ miter. Notice that the legs of the rocket are clearly inspired by the rocket from the “Destination Moon”/”Explorers on the Moon” Tintin albums. Below is the drawing we could find in Het Nieuws van den Dag of 2 November 1960. Thanks to Peter Van Hooydonck for the great detective work! 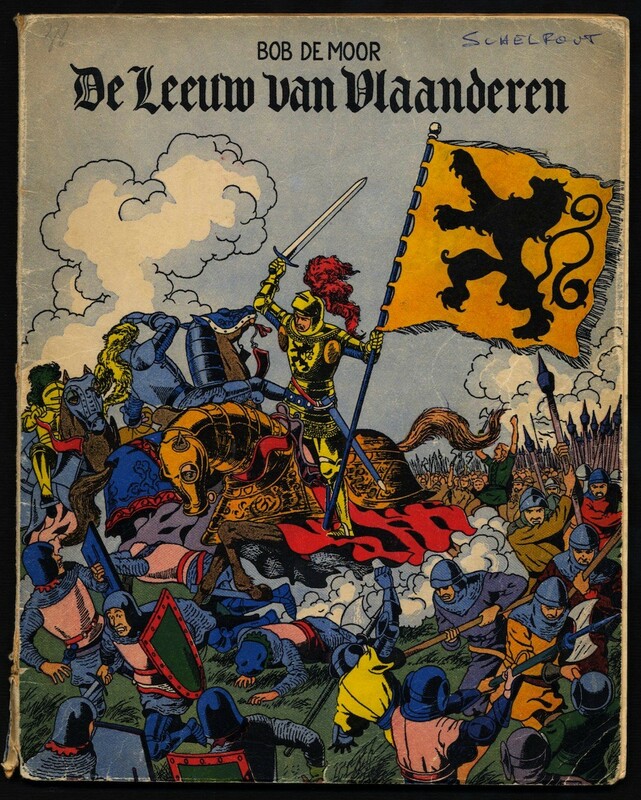 “De Leeuw van Vlaanderen”, probably one of the best known (and appreciated) album ever created by Bob De Moor has seen several reeditions overtime since it’s creation almost 70 years ago. 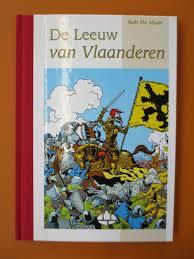 Bob De moor always took care of the cover artwork which changed with almost every edition. However, when in 2002 the BCB (Belgisch Centrum van het Beeldverhaal) and the Belgian Post released a brand new pocket edition of the album, many thought that the coverartwork had been taken from the 1952 version as edited by the Standaard. However, if you look really close you can see that it bares some details which you’d never find with Bob De Moor but rather with the work created by his son Johan De Moor. When I first bought the album it was the first thing I noticed when scrutinizing the drawing. This had to be Johan. And that is precisely what has happened. For the occasion Johan De Moor recreated the 1952 coverartwork. 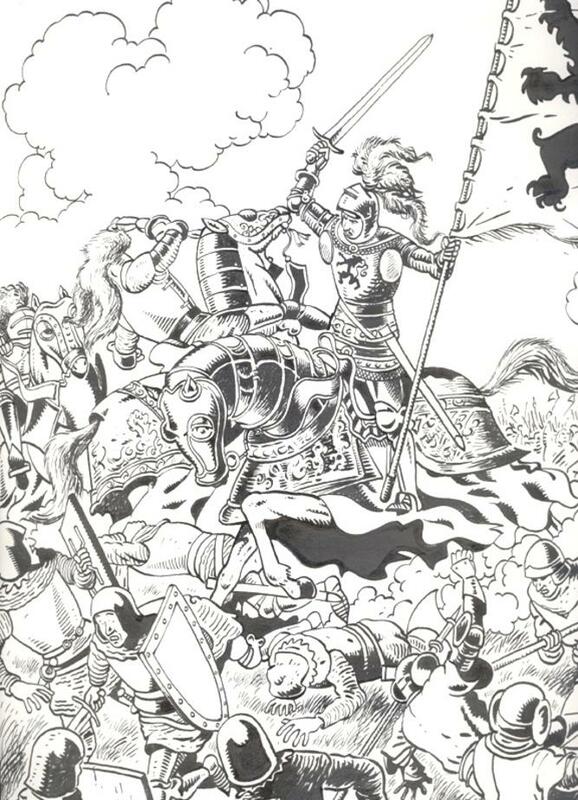 We found the original black and white drawing of that cover and although we only were allowed to use the picture the owner took (which is cropped unfortunately), you can distinguish some elements that show this is Johan De Moor at work. It most of all definitely shows the more ‘freeway style’ which Johan De Moor uses, the best example being the body of the fallen soldier (and especially his hands) where Johan De Moor decided to let his style take over instead of following the clear lines which his father set out for this drawing. You can judge for yourself below: The original drawing versus the version by Johan De Moor.